Buzz Trimmer Line: Ideal for edging. Bold and bright for a flat crop. Square shape. 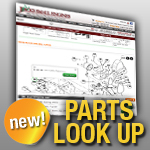 For trimmer parts and accessories, think Jack's.